this was read at the final banquet this year to a hushed gathering of survivors, soldiers, their families, and our students. . Thanks to all for making it very special. Robert H Miller photo. 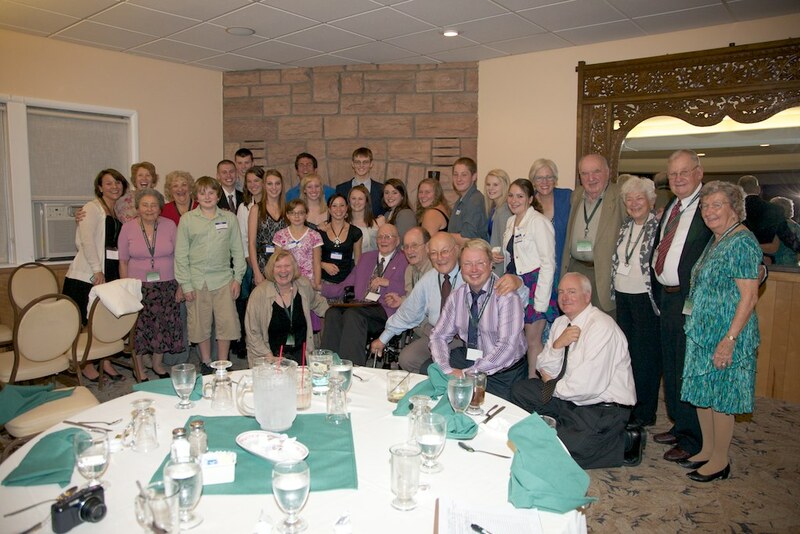 Final banquet, 9-23-11. I very much regret that I won’t be with you at the reunion. Please convey this statement that I wanted to share with you about my hour of liberation which has been on my mind for 64 years. My name is Martin Spett. I was born in Tarnow, Poland. My family and I survived the Tarnow Ghetto, slave labor, a political prison, and two years in Bergen Belsen Concentration Camp. It was April 7, 1945. as the American and British armies were closing in on the area where Bergen Belsen Concentration Camp was located. Five hundred people, including my family and myself, were forced to leave our Sonderlager compound. and forced to march 7 km. to a train. Although I was ill with double pneumonia, I forced myself to follow and keep up with the group. We boarded the train which already had 2,000 people aboard. Because of the surrounding allied armies, the train circled for several days. It stopped in a forest area near the Elbe river. We were not able to reach our real destination because of the bombed out bridges. We found out later that we were supposed to go to Theresienstadt Concentration Camp. The German commandant, who was in charge of the train, not knowing what to do with us, went to a nearby village to call Berlin for instructions. When he returned, we found out that he had orders to kill everyone aboard the train. You have to visualize this situation. Here we were in the middle of a forest with seventy German guards that set up heavy machine guns for our execution were waiting for orders from their commandant. But, he apparently had a change of heart and did not wish to follow Berlin’s instructions because the American army was closing in on all sides. During the night, we saw the German army retreating near our train and we saw the American army artillery fire that was aimed in our direction. We huddled together in fear not knowing what our fate was. The morning found us still on the train with only a small number of guards and a commandant who was waving to us from a bicycle as he was riding away. It was a beautiful sunny morning in the forest. All was calm and quiet. Later that morning , we heard a loud metallic, rumbling sound. A few minutes later, an American army tank came into view. As the tank stopped, an American soldier came from behind the tank and he started walking down the hill towards the train. He could only go a few steps when our people in their great excitement, fell before his feet, kissing him. At that time, the German guards surrendered and we then realized that we were liberated. The soldier stood there with tears in his eyes, telling us that President Franklin Delano Roosevelt had died the day before. It was now April 13, 1945. At this point, I would like to thank the brave American soldiers of the 30th Infantry who rescued us from our Nazi oppressors. Your brave deed has been in my heart for over 64 years. I never forgot you.